Congrats, Sarah! Your baby is SO cute. Of course you deserve a break to enjoy your baby. I'd suggest some books for you but my daughter is in high school and I'm sure you already know the ones we read because they are the popular ones like Brown Bear, Brown Bear, Pat the Bunny, etc. Enjoy your time with your sweet baby! I think my kids' all-time favorite picture book is CHICKA CHICKA BOOM BOOM. Your is a *bit* too little for it yet, but it's a great one! I really love the Begin Smart series for newborns and younger babies. "Peekaboo Kisses" was a big hit in the early months too and still stands the test of time. I'm selecting board books for our system these days and here are some I've really liked lately. So many congratulations! There is nothing better than bringing home your new baby for the first time. And raising boys is very, very fun! Congratulations! Of COURSE he's already a reader. He's got the best mom showing him the way! I'm partial to Mem Fox's books - especially Ten Little Fingers, Ten Little Toes and Time for Bed. And Leslie Patricelli's books! Yummy Yucky is my fave. We read it before every nap and bedtime. Very soothing cadence and gives the opportunity for many head kisses before laying the baby in the crib. I seriously think she knew that she was supposed to go to sleep after we read that book! Congratulations! He's a lucky baby! Seconding the BeginSmart recommendation, and Kiss Good Night, Sam. We also really liked: ABC, Baby Me! by Susan Katz, 10 Little Fingers and 10 Little Toes by Mem Fox, Everywhere Babies by Susan Meyers, Goodnight Gorilla (of course), Hug by Jez Alborough, and various by Sandra Boynton, Helen Oxenbury, and Leslie Patricelli. Happy Reading! So happy for you. Congrats! We loved Sandra Boynton board books when our boys were babies. Congrats, it's so cute to see you reading to him! Beautiful little boy. Congratulations, and enjoy this time with your new baby. Congrats, Sarah! And hooray for raising a reader. 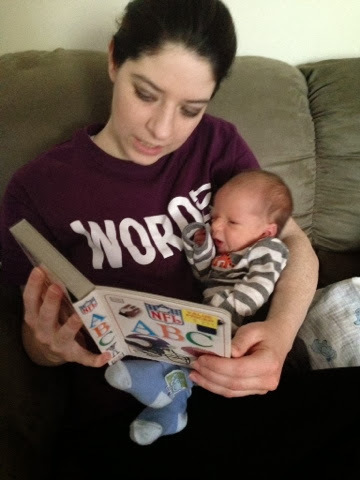 My little guy's favorite (and mine) is Belly Button Book! by Boynton. We love Sandra Boynton and Caroline Jayne Church's books: "How Do I Love You?" "Good Night I Love You" and "I Love You Through and Through". There are four "Llama Llama" board books that have fun rhymes and actions.